Sometimes it annoys people… and I love it. When it’s time to go to the hospital we usually plan to go in with our top 2 girl and top 2 boy names, and then narrow it down after we meet our new baby human. With all 3 kids I’ve had a “gut feeling” of what we were having (I’m 3/3! ), and I tend to focus more on that list than the other. This time around my gut said girl, and Elena was pretty much the only name on that list from the very beginning. The tricky part for us was figuring out her middle name. For the longest time we settled on Elena Kateri, since St. Kateri has been one of our family’s patron saints. But as we got closer to the due date it just didn’t feel right. I still love the name Kateri, and who knows… maybe another Baby Johnston will end up with it. Kateri just didn’t seem to fit quite right with this baby, so about 2 weeks before the due date we started playing around with other options. Since her due date was close to a Marian Feast Day, the next option was Elena Marie in honor of the Blessed Mother. However, after a while that didn’t feel right either. Don’t get me wrong, Marie is lovely. It’s my Mom’s middle name…but Marie just felt a little “Catholic generic”?  I’m sure I’ve offended a few people, but I guess what I mean is that Marie just felt like too easy of an option. 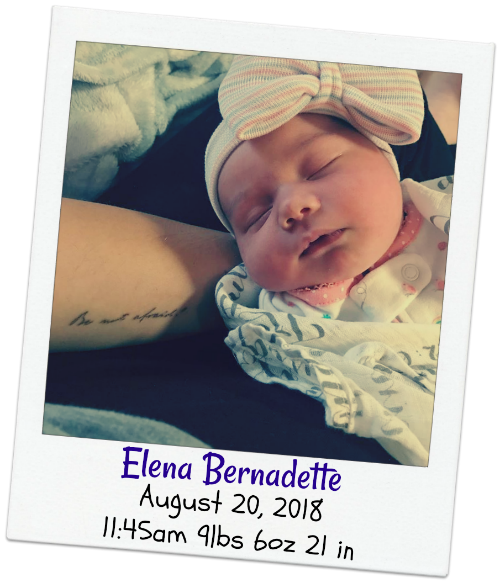 We had already decided that the middle name for a boy could be “Bernard”, so I suggested the feminine version Bernadette. This way she can claim both St. Bernard and St. Bernadette/Our Lady of Lourdes patronage! Once she was born it took about 3 hours for us to make it officially official. We’re also those weird people that come up with hashtags for our kids. #AlexandriaTheGreat came naturally, as did #SimonTheZealous, since he’s named after Simon the Zealot. 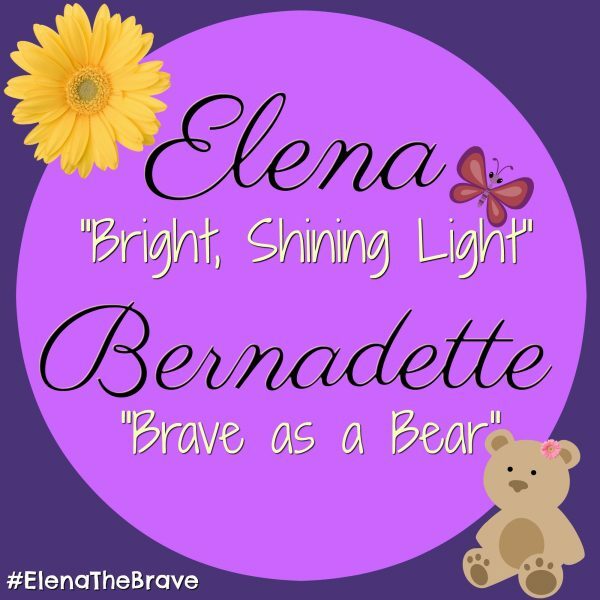 Elena’s moniker was a little more difficult… At first, I thought #ElenaTheIncredible… but that made my husband wince. When we thought a little more about the meaning of her middle name and whom she was named after, #ElenaTheBrave just made sense. Bernadette means “brave as a bear”, and both St. Helena and St. Bernard demonstrated what I would call bold and brave lives. So far our kids have all lived up to their nicknames (especially that Zealous Toddler!). Considering Elena basically came out of the womb on her own, I’d say she’s already off to a good start! This is a story that all comes down to a nap, tacos, and bad cell phone signals. I knew I was going to be induced on August 20th at the beginning of August. Truth is, my kids get really comfortable in utero. Maybe genetics are to blame, but I need Pitocin to get things moving. I was induced with Simon at 41 weeks, and even though my water broke on its own with Alexandria I still needed a boost of Pitocin. All that to say, as much as I didn’t want to be induced, I’m glad we scheduled it. It helped me to cling to the fact that I would not be pregnant forever. This was our first Texas Baby, and I was very nervous about labor and delivery. 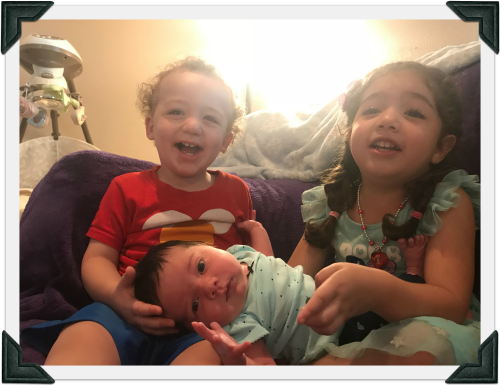 In Kansas we had an amazing Family Physician who delivered both of our kids, and a great Family Birth Center with a phenomenal team of nurses. Now that we’re in a larger city, I knew the experience was going to be very different. On the one hand, I was excited to deliver at a Catholic hospital for the first time. On the other hand, I felt like I was stepping into a lot of unknowns: new hospital, new procedures, and a doctor that I didn’t know as well. It felt like going into this for the very first time. 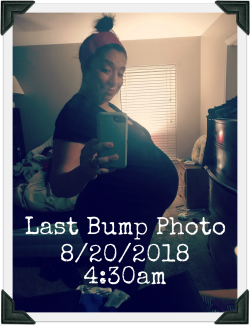 We were scheduled to check in at the hospital at 5:00am Monday morning, which meant that we were up a little bit before 4am to get ready to go. I didn’t sleep at all on Sunday night (combination of nerves and bad heartburn), so I knew this was going to be a very long day. Before we left I got an expedited version of a blessing before childbirth from my Deacon Dad, and we were on our way. We checked into the hospital and were set up in our labor and delivery suite by 5:30am. Michael put the Divine Mercy image underneath the cross in the room,which I planned to use as my focal point when it was time to push, I had my tattoos from Just Love Prints on each of my arms (Be not afraid and Totus Tuus), and I even spritzed some Holy Water around my bed because why not? 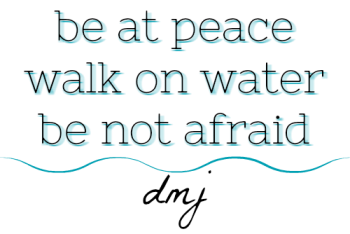  I had my rosary, Bluetooth speaker and my phone beside me. Let the games begin! I was officially hooked up to Pitocin at 6:45am and I was still at 3cm and only about 70% effaced (as I had been for about 3 weeks). This was really disappointing to hear, and I tried to mentally prepare myself for the real possibility that this day might end with C-section. The goal for each of my deliveries has always been healthy baby and healthy Mama, so I knew that if a C-section was what it would take to accomplish those things then that’s what needed to happen. But I’d be lying if I said I wasn’t a little bit scared. One of the things I started praying about in the third trimester was for any doctors or nurses who would be taking care of us at the hospital. Since I was feeling anxious about delivering in a new place, I figured the least I could do was pray that we’d have the right people on our team when it was time to deliver. God did not disappoint… I could not have asked for a better labor and delivery nurse! After introducing herself and getting more information from me, our nurse gave us the rundown of what to expect for the rest of the day: They’d continue increasing my Pitocin, my doctor would be making rounds within the next couple of hours to check me and break my water. 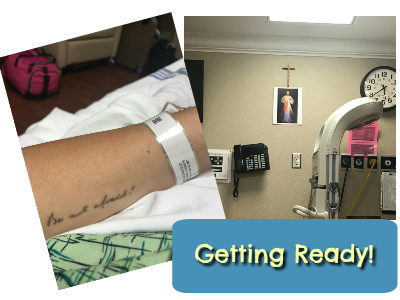 I could also get my epidural whenever I wanted, but I might want to consider getting it soon before the anesthesiologist had several other patients ahead of me. Once my water was broken things would likely go fast because this was my third baby. I specifically remember that she kept saying that things were going to go fast because every time she said the word “fast” I thought “Yeah right.” My hope at that point was to have a baby before dinner time, but my nurse was convinced that things were going to go much faster than that. By 9:00am the contractions hurt, but they weren’t unbearable. I bounced on the birth ball for a while, thinking about whether or not it was too soon to get an epidural and discussing it with the nurse. The anesthesiologist arrived around 9:20am, and after talking it through with him and my nurse for a few more minutes I decided to go ahead and get it done. One thing I wasn’t prepared for was that Michael would be asked to leave the room during the procedure. Usually Michael stands in front of me and holds my shoulders while the epidural is being placed. There’s about 20-30 seconds of stinging and burning that I dread, so when the doctor told Michael he had to leave, I got a little scared. Thankfully, between my calming music playing in the background and my amazing nurse, I got through it without any issues. The doctor commented on how much he liked my playlist, my nurse talked me through each step of the procedure, and just as we were finishing up my OBGYN arrived to break my water. My doctor came in to check me and I was only at 4cm at this point. She broke my water and by the time she left the room I was the most comfortable I had been in months. My back pain disappeared, the bed was suddenly super comfortable, and I fell asleep. I fell asleep and I didn’t wake up again until 11:00AM. I woke up feeling super relaxed. I was mostly numb from the waist down, though I could still move my legs a little bit. When the nurse came back in to check on me, she reminded me that I needed to let her know if I felt the urge to poop or push. I knew exactly what she was talking about because even with my previous epidurals I remembered what that felt like. 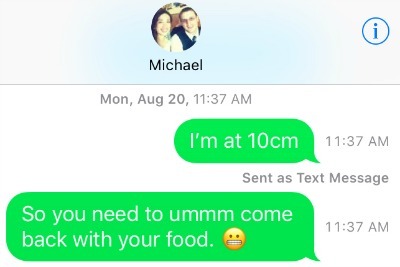 Around 11:15, I told Michael that he should go to the cafeteria and get something to eat. “Who knows how long this is going to take, and you need to keep your energy,” I told him. He hesitated at first, but went ahead and went downstairs to get lunch. Shortly after Michael left the room, I started to feel nauseated, so as a precaution the nurse got a barf bag ready for me and some nausea medication. “While I’m here, I’m going to go ahead and check you and see how things are progressing,” she said. In an hour and a half I had gone from 4cm to 10cm and I’d slept through the whole thing. About a minute later he came back into the room with some tacos and coke. The nurse came back into room to set up the room for delivery and to let me know that the doctor was on her way. At 11:41am I sent a text to my mom and another friend to let them know I was going to start pushing soon and asked for prayers. While we were waiting, the smell of Michael’s tacos hit me hard, and the nausea got worse. Michael’s such an amazing husband, that he stepped out with his lunch. At the time I thought he was just on the other side of the door… what I didn’t realize was that he had walked all the way to the lobby and was now on the other side of security. As I was texting Michael I heard the nurse tell someone to call my doctor and tell her to get here NOW because the baby was coming. She must have also called for a team to help because all of a sudden there were 5 or 6 other nurses in my room. I set the phone down beside me (without hanging up) and I remember taking a breath to push, and then feeling the baby just slide right out! All of a sudden this beautiful crying baby was placed on my chest with a head full of black hair. Y’all everything happened so fast that I think it took my brain an extra minute to take it all in. In about a 60 second window I went from texting and trying to call my husband to holding my newborn baby girl in my arms. Thankfully, even though he missed Elena’s speedy entrance into the world, he still got to cut the cord. Apparently, when he left the room Michael went all the way to the lobby on the other side of security. So when the team of nurses came rushing into my room, there wasn’t anyone at the desk to open the door for him! But it all worked out in the end. One of the things I will always remember about Elena’s birth is how much laughter was in the room when she was born. 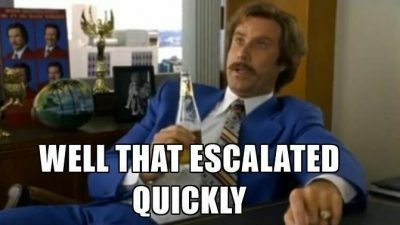 It was just a comical situation and it seems like everything escalated quickly in about a 2 minute window… there I am just laying in bed and apparently my baby was just coming out on her own, unbeknownst to me. When she was out I laughed because I couldn’t believe what was happening, Michael laughed when he got into the room and there was a baby there, and the nurses laughed right along with us. The laughter seems fitting. The moment Michael and I found out we were pregnant, we laughed. We laughed and we hugged and we laughed some more. God is just so good. The name Elena means “bright, shining light”. I’d say that from the moment we knew she existed, Elena brought a bright light of joy into our family. 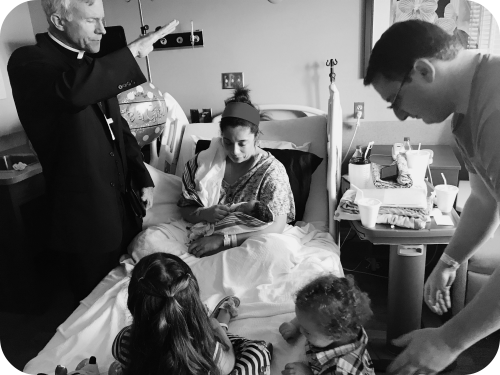 One of the things that made Elena’s birth day extra special was that we got a surprise visit from our Bishop that afternoon! We even got our first “Family of 5” blessing from him while he was there. 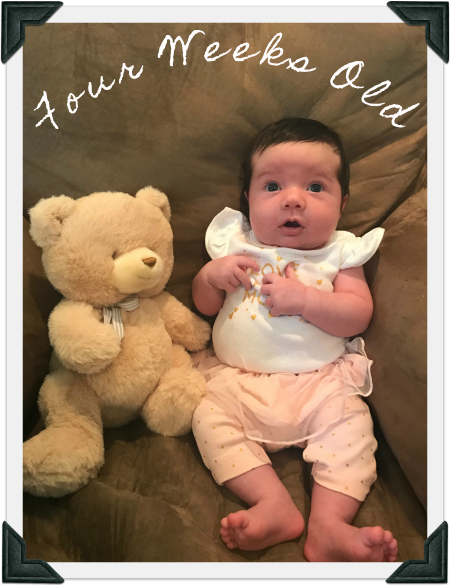 Elena is 3 weeks old today, which is really hard to believe. While this change from 2 to 3 kids has been challenging, the funny thing is that it only seems right that Elena is here. She was always supposed to be part of our family. While yes, our house is a lot louder now than it was before, and Michael and I are learning how to play “zone defense” now that we’re outnumbered, we wouldn’t have it any other way!